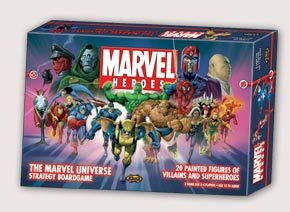 The heroes of the Marvelâ„¢ universe come to life in MARVEL HEROES: the Board Game! Thwarting robberies, solving mysteries, and rescuing citizens from danger are all in a day's work for members of the Avengers, the Fantastic Four, the X-Men, and the Marvel Knights ... unless there's a super villain involved! The action unfolds in New York City, on an impressively detailed and accurate map depicting Manhattan Island as well as Brooklyn and Queens. Players will respond to dangerous and crimnal events, represented by Headlines, that crop up across the city, sending members of their super hero team to rescue citizens, fight crime, and battle super villains. Meanwhile, the dastardly Masterminds work to their own purposes - and especially to defeat their Nemesis super-team!